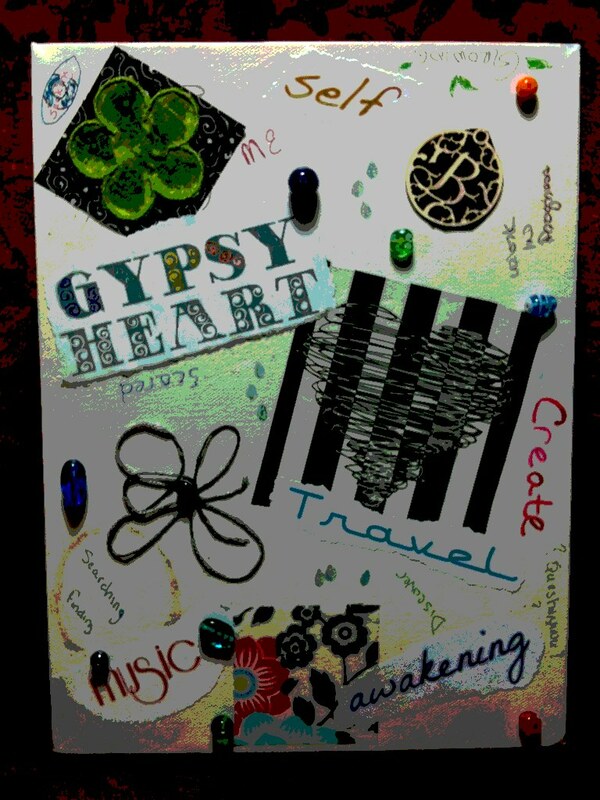 It’s a canvas that I decoupaged with various items, including yarn, glass beads, words, paint, fabric, and ink. It’s a mish mash basically, but a fair representation of where I am in life right now. 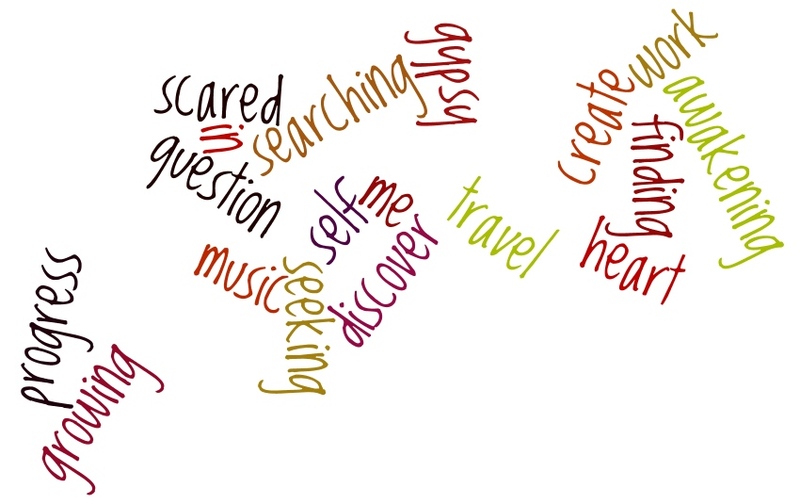 I also created a “wordle” based on the words I used through out the “self portrait”. I’ve been doing a lot of thinking, soul searching, and reflecting lately. A little of that is reflected in a recent post and more is to come in this post and possibly following posts. I don’t know yet how far this will go, or what it will look like. I’ve been hesitant to post this too, but I feel that there is something in all of this that needs to be shared either with someone else or it’s just something I need to get out of my system. Either way, here it is. Moving to a new place (if you’ve followed this blog for any period of time you know the journey, otherwise you can read more in the archives) has been an adventure. Having been here almost a year, I can now look back over the journey and see with clearer eyes what has transpired. I’ve been reflecting recently on the past year, what all has happened since we began our “Great Adventure” and where we are now. Or more specifically where I am now. And where I’ve been for the past 14 years. Some of you may or may not be old enough to remember the after school specials, and the campy movies that came out during that time frame. One that sticks in my mind (and there are many for some strange reason) is the movie “The Boy In The Plastic Bubble” starring John Travolta circa 1976. It was based on a true story of a boy who had to live in a completely sterile environment, hence the bubble. Obviously he had to live in this bubble for health reasons, and that’s not the point of this post. But it does help to illustrate the point I want to make. Have you ever considered you may be living in a bubble? It’s easy to create one, not so easy to realize you’re in one though. For me, I didn’t realize the bubble I was in until after we moved. I can look back on it now and see how insulated and in some cases isolated I was during that time. Some of it was self imposed, some of it was due to the area and the prevailing attitude of the place. When you live in a town where you are made to feel an outcast because you are not born and bred there, over time it tends to affect your view of life and yourself. Unless you are one of those people with a self esteem made of an indestructible material, at some point you will be affected by this oppression. A little background ~ I grew up in Pittsburgh. A large city, where when I was a kid they bused us white kids to the black neighborhood to integrate the school, many friends were of varying ethnicities, a vibrant nightlife that I took part of for many years, and a variety of other influences, both good and not so good. Fast forward some years and I find myself living in a small town, in the south where (sadly) there were still klan rallies being held, in a completely unfamiliar place, new job that I really didn’t feel qualified for, and basically an outsider. You can imagine what it felt like – a fish out of water is not a far cry from what it felt like to me. I made friends easily enough where I was working, since I was spending 14 + hour days there, where else I would I socialize. Thus, the beginning of the bubble. Add to that the nearest major city with any sort of decent shopping, restaurants, or ethnic groceries was over an hours drive away; another layer of the bubble is added. After a while, the job came to an end. The small company I worked for was bought out by a bigger company – which was a good thing and a not so great thing. Good because of a financial windfall, bad because so many of us lost our jobs. Good also because we were able to adopt our daughter, buy a house, and pay off our debt. Bad because friends that I had become close to moved away to find better jobs or other opportunities. But now we enter the next layer of the bubble. “Stay at home mom” or SAHM for short. It was a tough transition going from independent, working and managing a team of developers who were relatively independent, to suddenly having someone depend on you for their every need. We had neighbors moving in around us, new houses being built, and new friendships were made. Other kids came along in the neighborhood that became playmates and classmates. Suddenly the world revolved around the activities of a child, no longer the adult. The bubble had changed, but it was still a bubble. All that I had dreamed of what pushed back yet again. There were hobbies that occupied some of my time, there were volunteer opportunities that allowed me some creative outlets. But the dreams of writing, creating, taking part in an industry that my heart had longed to be a part of so many years ago, was buried so deep, they soon became forgotten. Please don’t get the wrong idea and think that there weren’t great times, and great friends as well, there certainly were. But there was something missing too. Something I couldn’t identify at the time. Something that would take me a while to realize, only after we left that place, got away from the bubble we were in, and began what was to become the next phase in life. More to come. I’m learning to work in small spaces. If you know me in real life, you know that I’m tall. 5 feet 12 inches as a friend used to tell me. 🙂 So I don’t do well when it comes to working in small spaces or having to handle small things (like tying itty bitty bows). I’m not claustrophobic, I just need room to stretch out and be able to put my long legs somewhere. So having moved from a house with 4 bedrooms, 2 living rooms, and a 2 car garage to a 3 bedroom, 1 car garage apartment has been, let’s say a challenge. So when it comes to working on my projects, if it takes up more room than my lap, I don’t have the room to spread out like I used to. So I’ve learned to adjust and work in small spaces now. A chair in the corner of the living room has become my writers corner. The right end of the couch has become my knitting nook, and a 1/3 of what would normally be a bedroom has become my craft area. This room also serves as Dean’s office and Amy’s art room. So you can see we all are working in small spaces. But what I’ve found is that it’s not the physical space that limits my creativity. It’s that space in between my ears that I allow to place limits on what I think I can accomplish. And while that may be a small physical space, it is vastly larger than I usually give myself credit. How about you? Where do you find you work the best? Wide open spaces or do you have a small nook somewhere that you find your creativity can run rampant? 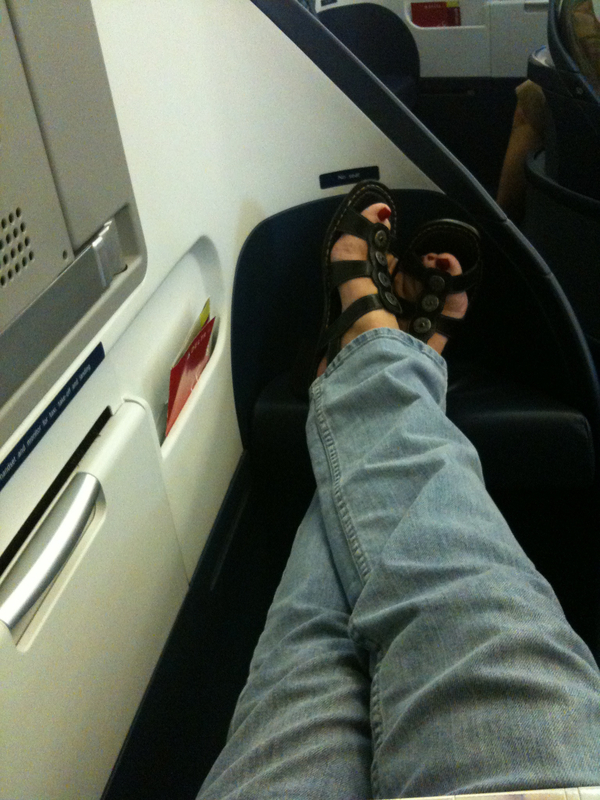 * One of the few times I’ve actually had enough leg room on a flight. First class from ATL to LAX.